Tracy & I ran a 5K on Saturday morning. Yep, we sure did! I have proof, you wanna see?? It was fun! More fun than I expected it to be. I was a little scared, intimidated and generally didn’t have confidence but then we started & it was great! Easy, actually. For a first ‘race’ it was a great experience. We met a girl (she thought we were in college, ROTFL) from San Diego that came to run but decided her upgraded hotel bed was too nice to get out of to go run a 10 miler. So she was on the sidelines with us watching the first men come in from the 10 miler and chatting. She promised that if we trained for next years 10 miler she would come up & we would run it together. I have to say, I am intrigued by that. We’ll see just how much my running career advances in the next year. Considering I started running just a couple of months ago with a program & did my first 5K, I may be on track for 10 miles in a year from now! 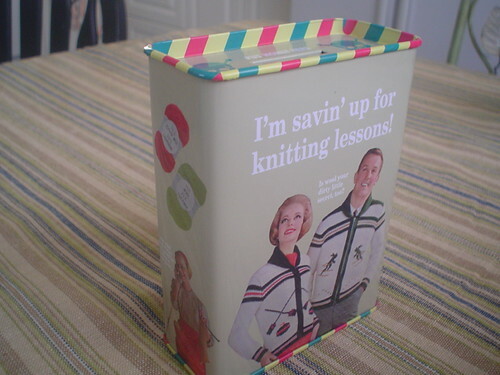 I am also on the Dash for Stash ravelry group and I have to say, it motivates me! I pay myself for each mile I run/walk and meeting goals I set. I am a good girl and deduct $$ when I don’t meet a goal also. I use the sweet bank my sister Cori got for me, it’s appropriate! Exactly what I needed to save for stash. 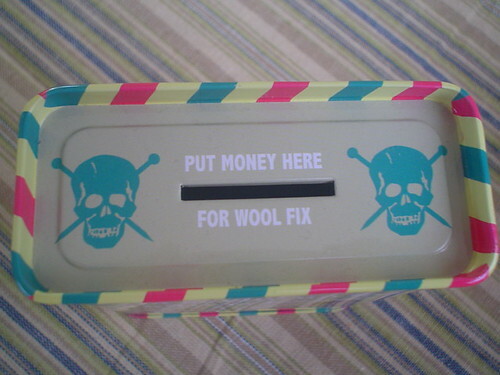 Now, if I actually take the money from there when I do buy yarn it will be a miracle. I am the type to say it’s saved for something else & never actually use it. I do think I will use it on the Silky Wool in red that Knit & Pearl ordered for me. They are a kit from the Woolgirl 2007 Sockclub. They were February’s shipment and of course they are called Blush. The yarn is a Squooshy yarn and fantastic to knit with even if the pooling is making my brain flip over in my skull continually. I hate the pooling on these for some reason. 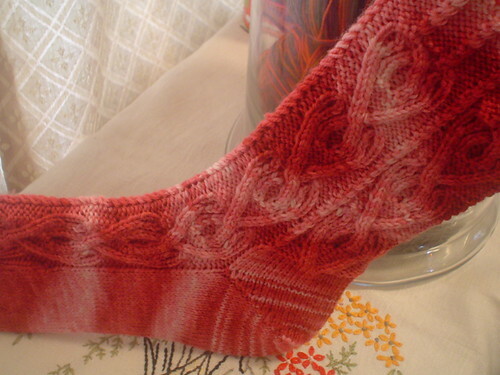 The second sock is half finished and will be done tomorrow probably. I think they are fantastic for Mother’s Day. I also finished a pair of Jaywalkers out of STR lightweight Jingle Bell Rock for Mom. She’ll have 2 new pair of socks to keep her freezing Idaho toes warm. You go girl! I am so proud of you. Running will never do for me. Tried a class and just couldn’t do it. I’ve walked a 5K but never intend to run one! I have to say I did join the YMCA last week and started a weight training program and am swimming again. Feels good! And mom will absolutely love the socks. I am jealous. Need to get something for her. Probably flowers again!